A violent explosion in space touches off one of the most thrill-packed adventures in Tom Swift Jr.'s scientific career. The appalling news that a cargo rocket has disintegrated while en route with vital supplies to Swift Enterprises' research base on the asteroid, Nestria, sounds a grim warning that the lives of Nestria's personnel are at stake. To rescue the marooned men, Tom undertakes a hazardous voyage to Nestria, only to find the way blocked by an invisible barrier of deadly radiation created by an unknown enemy whose objective is possession of the base. Tension mounts at Swift Enterprises when a mysterious Oriental is shot while attempting to warn Tom that his life is in danger from the Black Cobra. The Oriental's mumbled warning, plus some revealing data collected by United States Intelligence, sends Tom winging to a secret fortress in South America for the first encounter with his inscrutable foe. But the decisive encounter is destined to take place in space. 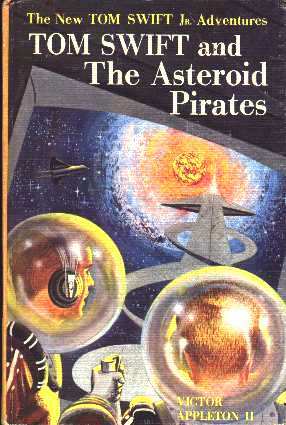 How Tom uses his new invention, the magnetic deflector, to crack the radiation barrier around Nestria, and how the young space scientist and his crewmen pit their wits and courage against the asteroid pirates and their diabolical leader, the Black Cobra, will hold every reader breathless with suspense. This book is a fine, normal Tom Swift book, except for one thing. There is one small (but easy to make) error in this book, and while I wouldn't call it a mistake, I would like to spend some time discussing it. The odd point about this book is the field of antimatter particles that the Black Cobra put around Nestria (and it was a barrier of antimatter -- see page 119 for the proof). This could never, never have happened, for the simple reason that the field of antimatter would have completely obliterated the satellite, and possibly earth as well. Why? Simply because matter and antimatter do not mix. If antimatter ever comes into contact with matter, they instantly annihilate themselves into a shower of gamma rays. In fact, according to some sources, a single gram of antimatter, properly spaced, could completely destroy the entire planet Earth. That's a lot of exploding power, and it means that, if a barrier of antimatter was put around Nestria, it would have annihilated the planet instantly if it had ever came into contact with the planet's atmosphere. All right then, you might say, suppose the barrier didn't come into contact with the moon's atmosphere. There would still be problems. Remember how the enemy was able to get through the barrier by flipping a switch and dispelling the barrier? This would be the biggest mistake a person could make. Remember how explosive antimatter is? If you dispelled the barrier into space, you would, in effect, be scattering antimatter atoms randomly outward, away from the planet. Plowing into even a small patch of antimatter would be both unavoidable -- and deadly. And how did the Black Cobra control the moon's atmosphere? Supposedly he had a machine on the surface that would dispel the barrier, but how did he communicate with it? Radio is the answer given, but that couldn't have worked -- Tom tried desperately to communicate with the moon by radio, and he had a desperately hard time getting through. But, let's suppose that the barrier didn't touch the moon's atmosphere. Let's also suppose that he had a way to control the barrier, a way to communicate with his machine, and a way to plow through the barrier (although that's a lot of supposing). This still leaves one more point -- namely, how did he keep the barrier from disintegrating? Space isn't a perfect vacuum, and doubtless every now and then a normal atom would wander into the field and annihilate itself into a shower of radiation. This must have happened a lot, too, because Tom could only get a scraggly reply through the barrier from the moon at certain times of night (and no reply at all during the day), when the field would have been at its least active point. This hints at a lot of activity in the barrier, which means that the barrier must have had to have been re-seeded every now and then. So how did the Black Cobra accomplish this? Maybe he went up once a week to Nestria and did the job, although this is highly unlikely. All of this discussion ignores the fact that antimatter is extraordinarily difficult to create. In fact, it wasn't until 1997 that the first atom of antimatter -- an anti-hydrogen atom -- was created, and it only lasted for a few billionths of a second. How could the Cobra have created the enormous -- let me repeat myself, the enormous -- number of atoms that would have been needed to put a barrier around an entire moon? How did he ship the atoms into space? There are clearly some very grave scientific problems here, and while I won't say they aren't unfixable I will say that they make the whole deal pretty far-fetched. If you put aside your disbelief, however, the story is actually very imaginative: a group of scientists come together and decide to steal an asteroid by putting a field of antimatter around it, starving out its inhabitants, and then moving in. In my mind this is far more imaginative than having the base attacked by a fleet of enemy ships, or having the enemy invent some kind of new death-ray. Some thought went into this plot, and I appreciate it; despite its obvious and glaring scientific irregularities, this book is still one my personal favorites. This book is one of the only books in the entire series in which Tom invented his invention to fulfill a need that he had. Usually (and book #22 is a good example) Tom Swift invented his invention, and then, out of the blue, he had a good use for it. This is not the case here, however. Tom's one and only invention in this book is his Magnetic Deflector. (Do you see that spirally silver twisted thing on the cover of the book? That is the Magnetic Deflector.) The Magnetic Deflector has one and only one purpose -- to repel antimatter. It's pretty similar to Tom's repelatron, with the exception that the repelatron works with ordinary matter and the magnetic deflector works with antimatter. Now that the flurry had subsided, he stared at the strange-looking device on Tom's workbench. It appeared to be a heavy metal figure eight, with the top loop of the eight twisted at right angles to the bottom loop. A wire-wound rod protruded through the two loops. Two heavily insulated tubes connected this assembly to a large, boxlike console. "What in tarnation do you call that thingamabob?" Chow said, venturing in to examine it. "A magnetic deflector," Tom said. "I'm hoping it'll crack the radiation [read antimatter] barrier around Nestria. This is just a pilot model, of course." As always, the loyal cowpoke was eager to hear more of his young boss's latest invention. Tom explained that the figure eight contained an inner core of a special alloy, partly Lunite from Nestria. This was designed to carry a heavy flow of current in a bath of liquid helium. "The helium chills the alloy so cold that it has no electrical resistance," Tom went on. "Once a current starts flowing through, it just keeps going with no further electrical input." The current flow, he said, sets up an intense magnetic field in and around the probe output tube. This was the rod piercing the figure eight. "Each time a voltage pulse is applied to the probe, it pushes that magnetic field right out of the rod--shoots it out, you might say." "Like squirtin' toothpaste out of a tube?" "Right. And that's what repels the antimatter particles to clear a safe path for the spaceship." Tom's eyes glinted. "In effect, it'll punch a hole right through the radiation barrier--at least that's what I'm hoping." How feasible is it to build a Magnetic Deflector? Well, that's hard to say. The device really doesn't appear to have any theoretical problems. Its construction does hinge on that Lunite ore, although I imagine that a suitable (and perhaps better) substitute could be found. The real problem is the fact that this device has no place in modern life -- after all, who wants to punch a hole through a barrier of antimatter? How much impact would a Magnetic Deflector have on civilization? It would have no impact at all on modern life, for the simple reason that there are no antimatter barriers to dispel! If you read the book immediately preceding this one (Tom Swift and his Megascope Space Prober), you will recall that, on the last page, Tom and Bud were asked to head an expedition to Venus. In the first paragraph of this book, however, a solar flare-up (and yes, such solar flare-ups do exist and happen) caused too much interstellar radiation and thus canceled the trip to Venus. It should be noted, however, that Tom did get around to going to Venus, although it took him 11 more books (he did it in the book Tom Swift and his Cosmotron Express) to get around to it.